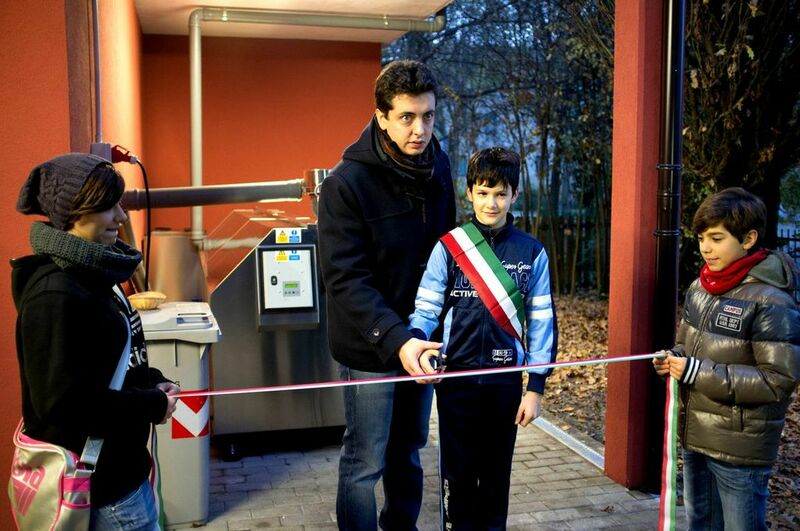 Saturday, November 24, 2012 a Big Hanna Composter model T120 was inaugurated and immediately after put into operation at a school’s canteen in the town of Pieve di Cento, a town with about 6,000 inhabitants, located in North Italy. 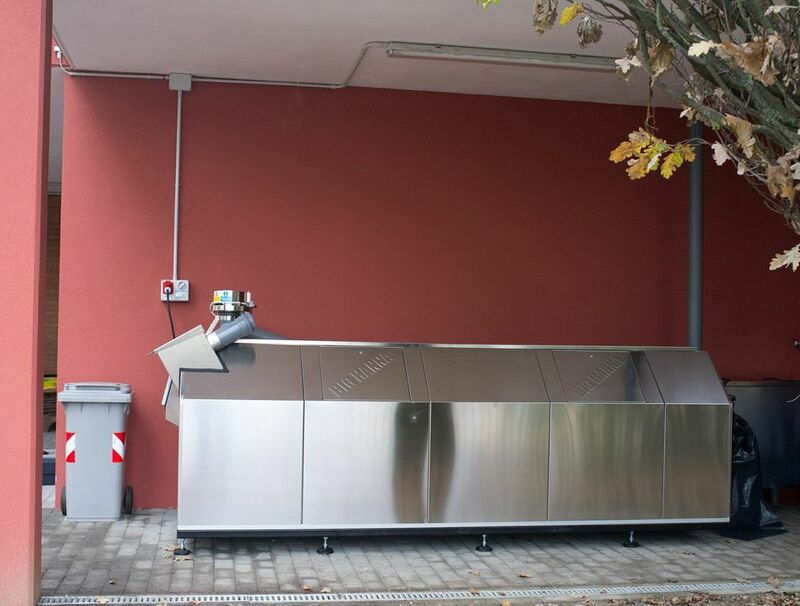 The Composter was purchased by the City of Pieve di Cento with a loan obtained from ATO Bologna (Area Authorities of the Province of Bologna with its 60 city halls, which is responsible for monitoring and control of water resources and solid waste). The composter has been installed at a food production centre operating within the spaces of the kindergarten’s canteen that produces meals for the kindergarten and primary school in the town, plus meals for elderly home care services and facilities operated by the local health institution. Big Hanna will reduce about 30 tons of organic waste derived from meals production and from waste residues of pre-school meals each year and will produce new compost in total estimated to 4,500 kg annually. The produced compost acts as a powerful fertilizer for the municipal gardens and it is also used in awareness-raising projects with the children so that they learn what waste and scrap may become: everything but trash! This is a great example of organic waste management, even better than recycling itself, because it will reduce the waste’s production to zero, turning it into something which is extremely useful in the same production’s place. Since the subject that produces waste is the same subject who reuses the compost on site, and there is no the willingness to dispose of the waste, no permissions are required. More details – contact our distirbutor in Italy – ACHAB S.r.l. We are very pleased to announce that we now have extended our range of Big Hanna models. 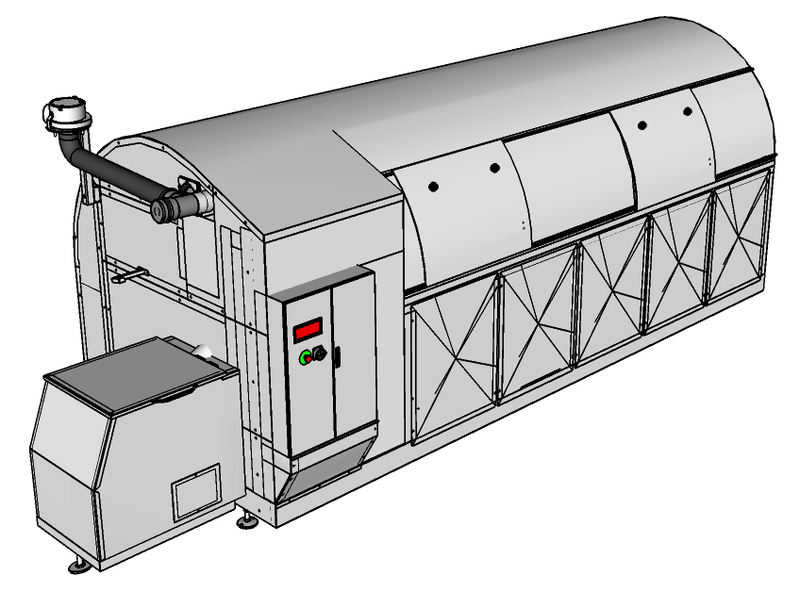 Many customers are looking for a solution to compost their food waste on-site having more food waste than our T240 model can handle. Our new Big Hanna composter is called model T480 and has a capacity of 800-2400 kg food waste per week. 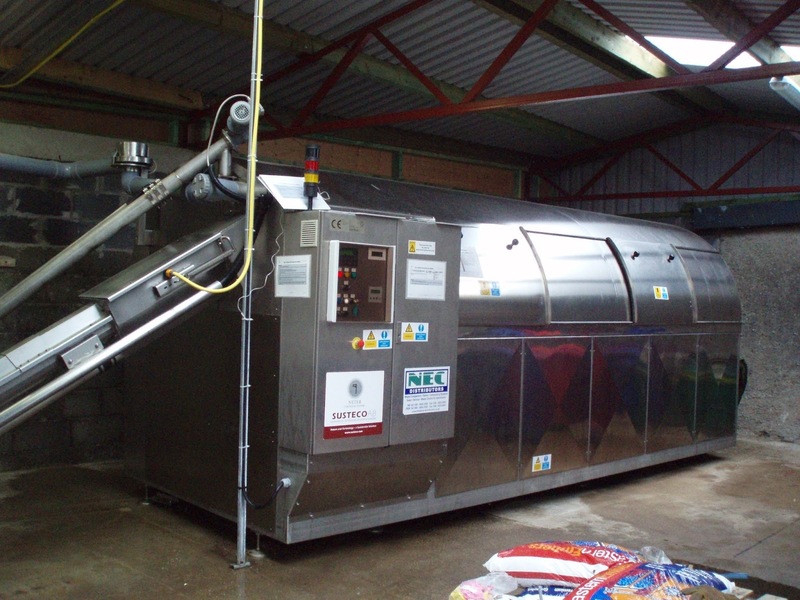 Used together with a dewaterer that capacity increases to 1600-3800 kg wet food waste per week or 800-1900 kg of dewatered food waste per week. In 2006 we installed a larger tailor made version of Big Hanna called Neter 8. After more than 6 year’s of reliable operation converting Kelly’s Resort’s food waste to compost we now include this size of cylinder in the Big Hanna range of standard composter’s – the model T480. The model T480 have a 80 litre hopper with an infeed auger, same as our model T240. A binlift is available for an easy handling of the food waste at the customers’ site. Respecting our environment it is important for us to build sustainable, reliable machines with a long life span. 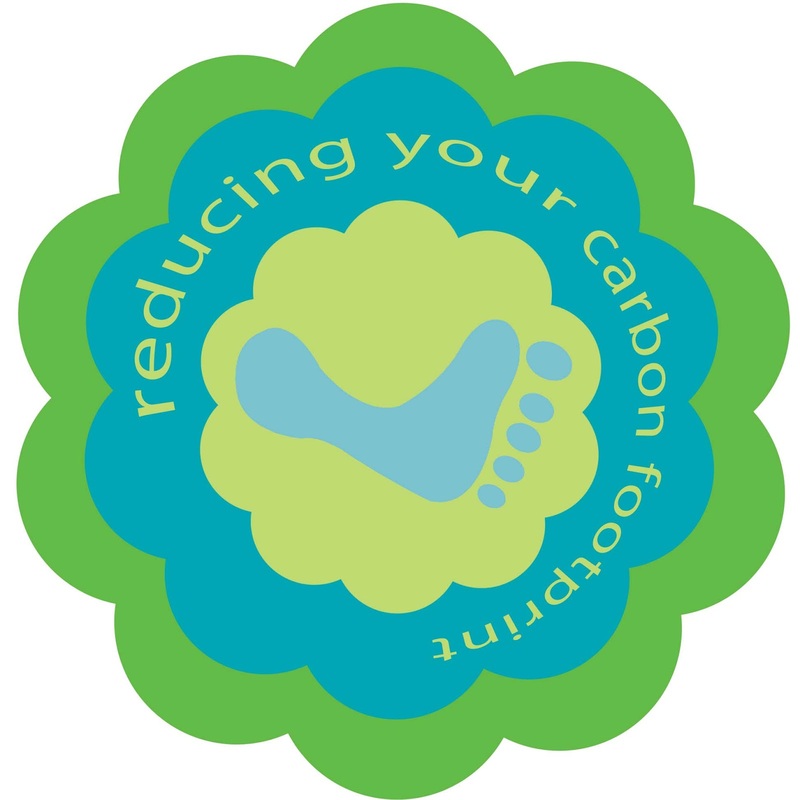 Composting reduce the carbon foot print and makes the GHG emissions calculation bottom line positive. Diverting food waste from landfill and composting it on site with Big Hanna model T480 saves up to 223 Metric tons of CO2EQ per year (or 352 Metric tons if used together with a dewaterer). Using the compost as a fertilizer provides us with the potential to enhance the growth of beneficial micro organisms in the soil in new or existing vegetation allowing more respiration in our atmosphere. Composting is therefore considered to have a positive effect on our planet helping it recover. If you are interested in our newest addition to the Big Hanna family contact us or read more in our brochure by clicking on the link below. Vsit our website at www.bighanna.com.